Highly efficient, high pH, aldehyde-free and non-foaming liquid concentrate for the daily cleaning and maintenance of dental aspiration and separation systems, with or without amalgam separator. 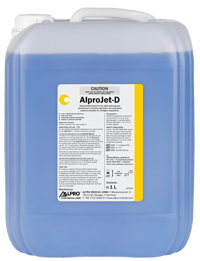 Prepare a 5 % (50 mL of Alprojet-D with 950 mL of warm water) solution in the AlproJet MixCup, rinse the aspirating tubes and the spittoon bowl, each with 1 L of the solution. Use daily. AlproJet-D is highly compatible with materials such as plastics, rubber, non-ferrous metal and alloyed steel etc. deodorizes and dissolves aspirated residues such as saliva, drilling dust etc. Modern combination of QAC and tensides.